I did not have a specific plan for them, other than some vague notion of attempting a Shepherd's Pie. But it's not really the right weather for such a hearty dish. 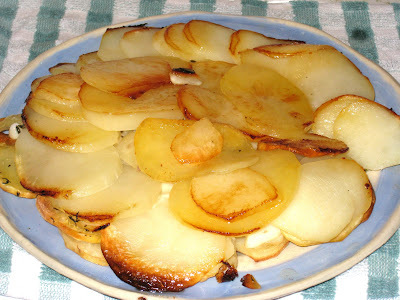 I had some pork chops defrosting in the refrigerator, so I thought I would bake up the potatoes as a side dish. And I remembered a recipe from my old standby, the Good Housekeeping Illustrated Cookbook. 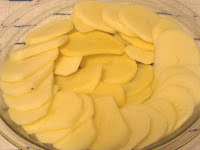 Something called Potatoes Anna, which is basically potato slices arranged in a pie plate and baked with a little butter. When they come out of the oven you invert the pie plate over a serving plate and serve it in wedges. It's a simple recipe, but tasty. But of course I thought I might make it tastier. I simply added some onions, garlic, and fresh thyme I had on hand. And it was, indeed, tastier. The only snag was that the slices didn't cook together into one piece, but I think that was more because I used waxy potatoes instead of russet than because of the addition of the onions and garlic. And then the next night, I melted some cheese over them. In a word: heaven. I am calling them Potatoes Annabella. After preheating the oven to 425 degrees F., I heated a tablespoon or so of canola oil in a small non-stick skillet. I added half of a thinly-sliced onion and 6 cloves of garlic, also thinly sliced. I kept the heat on medium low; I just wanted to sweat the onion and garlic until it was translucent. Then, while the onion and garlic were sweating, I sliced 4 medium potatoes and arranged them in a layer in a greased pie plate. 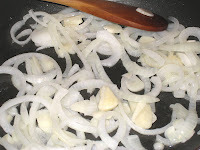 When the onions and garlic were soft, I poured them over the layer of potato slices. 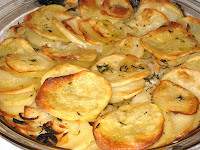 I added about a tablespoon of chopped fresh thyme and then covered it up with another layer of potatoes. I melted two tablespoons of butter with a teaspoon of salt in the skillet I cooked the onions and garlic, then poured it over the potatoes. I tightly covered the pie pan with aluminum foil and put it in the oven, letting it bake covered for twenty minutes. After the twenty minutes, I took the foil off and baked it uncovered for another fifty minutes. Here's how it looked when it came out of the oven. It kind of fell apart when I inverted it onto the plate, as you can see in the picture at the top of the post, but it was delicious. 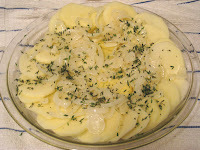 The onions and garlic were lusciously soft and complemented the potatoes perfectly.